Dynatrace – The only AI-powered, full stack, and automated monitoring solution. Applications and services today are increasingly complex. Microservices architectures, global distribution and a multitude of different client technologies continue to add to this complexity. Organizations must take a radically different approach to monitoring to stay in control of these applications, and the environments they run in. 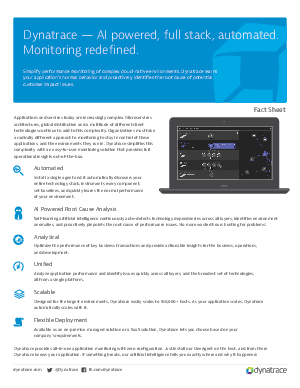 Dynatrace simplifies this complexity with an easy-to-user monitoring solution that provides full operational insights out-of-the-box. Self-learning artificial intelligence continuously auto-detects technology dependencies across all layers, identifies environment anomalies, and proactively pinpoints the root cause of performance issues. No more wasted hours hunting for problems! Available as SaaS, or on premise managed solution, Dynatrace’s deployment flexibility is sure to meet your company’s needs.